I was so happy to see this meme! It means that I’m not the only one who has these kinds of thoughts go through their mind… and perhaps come out in their sermons. There seems to be several perspectives in The Church as a whole on the subject of healing for the sick or injured body. Some groups teach an exclusivity in their acceptable source for healing, such as (1) healing by miracle alone by faith in Christ alone because [they say] the Cross is now complete and “by His wounds we are healed;” or (2) healing by medical science alone because [they say] God’s miracles ceased with the completion of the New Testament writing. My personal study and interpretation of the scriptures (and subsequent experiences that seem to confirm what I have concluded in the scriptures) has lead me to believe that God provides healing through various avenues, supernaturally and naturally, while ultimately our faith remains centered in Christ. “Whatever is not of faith is sin” (Ro. 14:23) is not just about a vegetarian or Sabbath issue, it is concerning all issues. A brief devotional, which this article is, cannot explore [and counter or affirm] every group’s healing doctrine that is within The Church. What we can do in this brief moment is look at a few scriptures that show God’s positive and affirmative comments about doctors (who represent the medical community and medical science). As we can see in several passages, Doctor Luke was a fellow minister and friend of the Apostle Paul. He was also the author of two books of the Bible: the Book of Acts, and one of the gospels, the Book of Luke. He was a doctor before he entered the ministry, and he continued to be respected as a doctor during his godly ministry. Again, this is a brief treatment of the topic of doctors and medicine. But, one thing that we can know for sure, those who practice medicine and care for the sick are being like Jesus, just as He was being like them in His ministry. “Some became fools through their rebellious ways and suffered affliction because of their iniquities. They loathed all food and drew near the gates of death. Then they cried to the Lord in their trouble, and He saved them from their distress. He sent out His word and healed them; He rescued them from the grave. My friend, are you a tweeker, a user, a meth-head, a crack-head, an alcoholic, a cutter, or hostage in one of many other addictions? Perhaps you have reached the point where you hate your addiction, you hate yourself and your powerlessness to help yourself, you hate life in general because it has become a dark chamber for self-inflicted torture. Your addiction, which might have started with someone “innocently” and “kindly” sharing a freebie with you, now controls you and drives you to do disgusting and dehumanizing things to buy your next fix. My friend, I have no condemnation for you. I know that your captivity is bigger than human wisdom and human power can heal. I do, however, know a Guy. He can set you free, clean you up, heal your body, and rebuild your life. His name is Jesus. He is one heartfelt cry away from leading you into a new, abundant life! Ask Him to intervene… He will! That is why He came into this world. Have you been following an invitation that you received from the Lord, yet you find yourself under water in a stormy sea that is too rough in which to stay afloat? Are your swimming skills and strength not enough to keep your nose above water? Is only your hand visible to the world around you, but the world seems to be preoccupied with their own survival in their own trials of life? This story is fascinating. Let’s look at some of the positive lessons that we can learn from it for application to our own storm-filled lives. He saw what Jesus was doing, walking on the water, and he inquired of the Lord whether he should or could join Him. “Come” is the Lord’s invitation to Peter, to come to Him doing the same thing that He was doing, walking on the water. The weather was stormy and the waters were choppy with waves from the wind. The atmosphere was difficult even for boats to navigate, much less to go swimming in. Peter’s courage and faith shot up at the invitation of Jesus to join Him, and he took the leap out of the boat onto the water. 4. Peter Walked on the Water! While we might erroneously focus on Peter’s subsequent sinking, we must not neglect to absorb the truth that Peter did actually walk on the water! 5. Peter Took His Eyes Off of Jesus. It was when Peter started to look around at the weather, wind, rain, and waves, that his faith and courage faltered. It was when he reconsidered what he was doing (walking on water) and compared it with his natural abilities (the irony here is that his name is Peter, which means Rock! ), that he began to sink into the stormy waters. 6. He Cried Out to Jesus for Help. Though we might say that his dire situation was obvious to Jesus, Peter nonetheless cried out to Him. 7. Jesus Rescued Peter from His Fear-Induced Sinking. Jesus had invited him to join Him on the water. Peter was in pursuit of being with Jesus, and The Lord was not about to neglect Peter. 8. Jesus Encouraged More Faith! Jesus did not rebuke Peter for leaping into this situation. He didn’t say, “That will teach you to leap out of a perfectly good boat that My Father has blessed you with.” Instead, Jesus encouraged that which makes a successful mission in life: having faith in Him. Cry out to the Lord. He will rescue you. He will restore you to your place ON the water instead of UNDER the water. He invited you to join Him where He was working, and His invitation was not to your own funeral. Jesus encourages your courage and faith that is anchored in Him and in His guidance. If Peter can walk on the stormy water, sink in the stormy water, and then be restored to walking on the stormy water… so can you be restored to the “walking on the stormy water” mission that Jesus has invited you in the past to join Him in doing today. Early in church history the believers began to experience the Baptism with the Holy Spirit that was foretold in the Old Testament by the prophet Joel, and foretold by John The Baptist and by Jesus Himself. 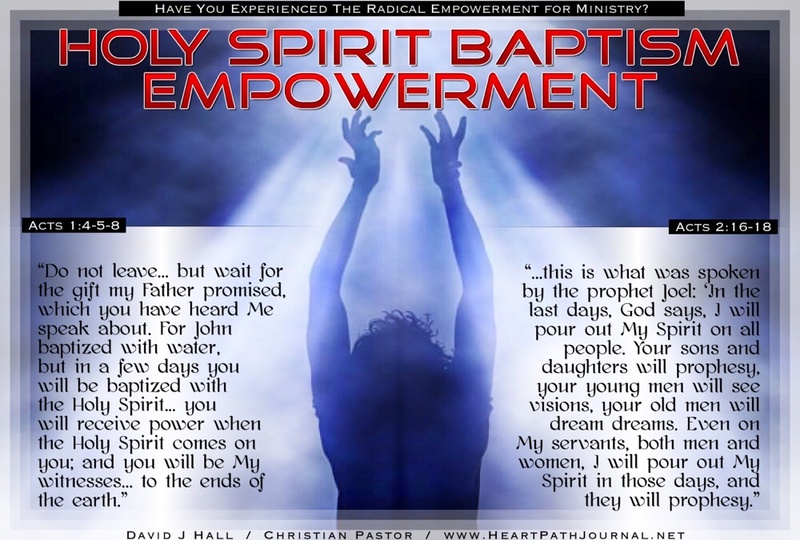 Jesus described the Baptism with the Holy Spirit as a divine empowerment for ministry. Throughout the Book of Acts there is recorded numerous instances of believers receiving the Baptism with the Spirit just as the others did in the Upper Room on The Day of Pentecost. While worshipping and praying (as they did in Acts 2), “wait for the gift” the Father promised. Jesus still equips His people with Holy Spirit Power for ministry that will impact the world, locally and globally. 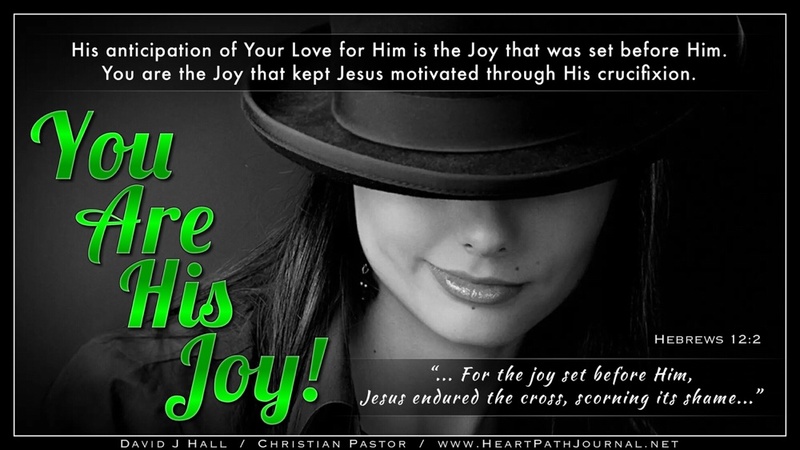 That joy that was set before Jesus could only be realized if He went through a crucifixion process. What could possibly inspire so much joy as to keep Him fully motivated to endure such pain, suffering, and shame? You! You are His Joy! His anticipation of your love for Him today is the joy that kept Jesus motivated through the cross those 2,000 years ago. Now THAT is a powerful Joy!